This page shows items that are not part of Naval Accoutrements, Pattern 1901, but are associated with it in some way. The Kit bag is somewhat of a mystery as far as its introduction goes. The KW Team has been unable to locate any List of Changes entries for it. Only a few official references have been located for it to date, Rifle and Field Exercises for His Majesty’s Fleet 1905 (Vol II)1, 1907 (Vol I), 1909, 1913 and the Commonwealth Government Harness Factory (Australia) Annual Reports for F/Y 1912/13, 1913/14, & 1914/152. While it is clearly associated with the Naval Accoutrements neither edition of Rifle and Field Exercises, 1909 or 1913, includes it in the items listed in the text that make up the Accoutrements (Pattern 1901) while in contradiction the PLATE I does include it in Articles comprising One Complete Set (of Rifle Accoutrements). The CGHF Reports however confusingly refer to it as Bags, kit, rifle equipment (1912/13), Bags, kit, Naval, rifle equipment (1913/14), & Bags, Kit 14 x 12 x 8 Navy Rifle Equip (1914/15). 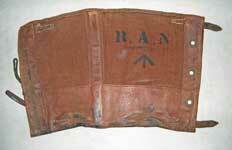 Just to complicate things, the 1912/13 report also refers to another Naval Bags, kit, canvas 14 x 12 x 8! This brings us to construction. Rifle and Field Exercises for His Majesty’s Fleet 1905 (Vol II) under The Landing Party states that “it is made of Willesden canvas”. 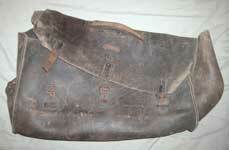 As can be seen the illustrated example is of all leather construction. 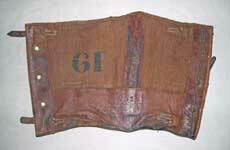 The CGHF reports indicate that there may have been at least two types of Naval kit bag. Weighing up the meagre evidence we at KW can only conclude that both canvas & leather Kit bags were made. The Kit bag was normally carried on transport, but had shoulder straps so it could be carried as a pack & a handle so it could be carried like a brief case. 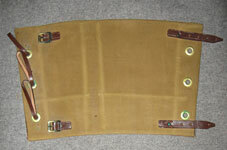 It has a full width flap closed with three tabs & buckles. The attached sketch is taken from Rifle and Field Exercises 1909. 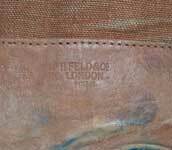 KW has only been able to locate one example to photograph being this incomplete and possibly altered leather example from the Chris Pollendine collection. It does not appear to be maker marked or dated. Photographs © Chris Pollendine 2011. If any KW reader can supply any other official documentation, photographs or information (period or modern), we at KW would love to hear from you. 1. Rifle & Field Exercises 1901, Vol I & 1904, Vol I not yet sighted, but may also contain a reference. Can you help? 2.From Parliamentary Papers various 1914 to 1919. Since photographers first started recording the activities of landing parties & Naval Brigades across the Empire, Gaiters have featured in their photographs, forever associating them with the accoutrements of the time. There has been some discussion as to whether they are correctly termed Leggings or Gaiters. We have chosen to run with the latter as the term Gaiters is used in RIFLE AND FIELD EXERCISES FOR HIS MAJESTY'S FLEET; Vol. II 1905 and more importantly in UNIFORM REGULATIONS, OFFICERS OF THE FLEET 18931. From this it would appear that the official RN terminology is Gaiters. 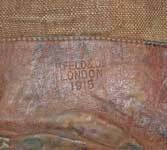 The early Gaiters were of canvas construction, presumably leather reinforced, Dutch laced up the side with three loops, the uppermost being secured by a leather strap which also served to buckle the Gaiter together. Around 1900 the design was changed slightly with the addition of a bottom strap as seen on the illustrated examples. 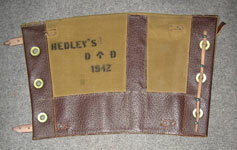 This pattern of Gaiter then remained unchanged until apparently replaced by an M.E. Co. designed webbing version in the early 1920’s, but like the Accoutrements, naval, pattern 1901, also supposedly replaced at that time, the canvas Gaiters were still manufactured during World War 2. 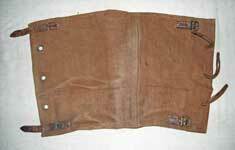 The Gaiters were manufactured in Britain and in Australia and possibly other parts of the Empire. The KWRT has not been able to find much in the way of documentation on Gaiters, so, if any reader can fill in some gaps, your input is most welcome. 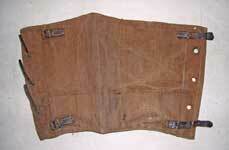 Inside views of the same pair of Gaiters. Note the R.A.N. marking on the left Gaiter. 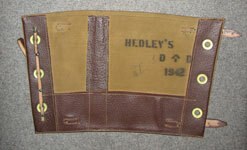 Interestingly, this next example is Australian Department of Defence marked & made by Hedley’s in 1942. From the Graham Tweeddale collection. Photographs © Graham Tweeddale 2011. 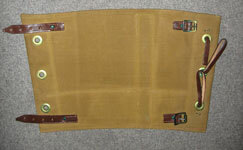 Inside views of the same pair of Gaiters. 1. The Officers' Gaiters described in the 1893 Regulations, while similar in design, were of black leather and should not be confused with the canvas pattern discussed here. 2. Interestingly CGHF used varying descriptions in their annual reports, “gaiters, navy” in 1912/13 while in the 1914/15 and subsequent reports they were “Leggings, brown, canvas, Navy”.